Start a Pen Pal Exchange project for students on the Virtual Writing Tutor. For instructions on how to create a pen pal exchange for your students, check out these step-by-step pen pal exchange creation instructions for teachers. Learn about the pedagogical value of pen pal exchanges here. Click here for an article on pen pals that students can read to introduce them to the concept of pen pal writing. What is a Pen Pal Exchange? 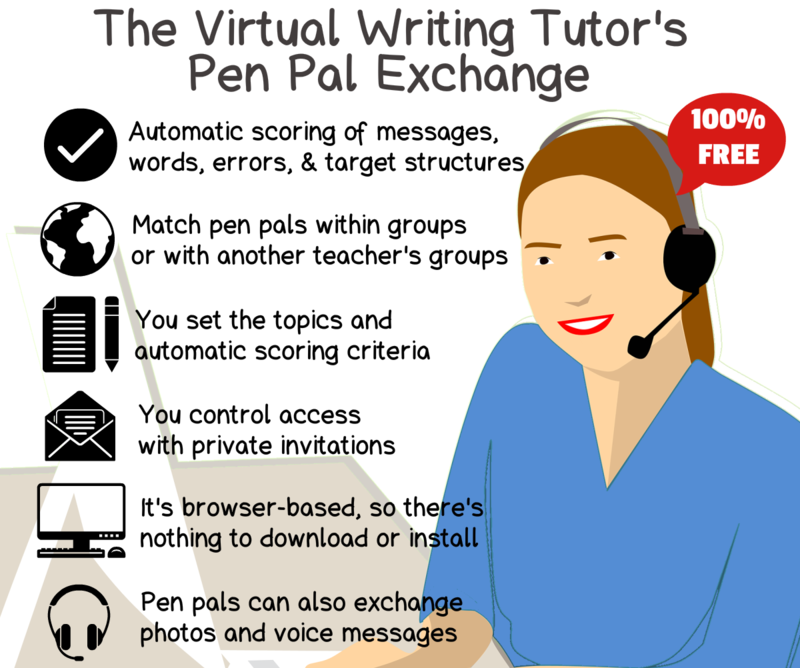 The Virtual Writing Tutor’s Pen Pal Exchange is a type of online forum, moderated by one or more teachers, with messages written by students and replies from their pen pals. Teachers can match up pen pals from the same group, from different groups, or from groups taught by collaborating-teachers located anywhere in the world. Whereas pen-and-paper pen pal writing projects generate stacks of handwritten letters for the teacher to give corrective feedback on, the Virtual Writing Tutor’s Pen Pal Exchange provides automated feedback on grammar, spelling, and vocabulary. How? The Virtual Writing Tutor’s Pen Pal Exchange links two very powerful elements of good pedagogy: teachers and technology. Yes, every teacher uses technology, whether they realize it or not. Blackboards and photocopies are forms of technology too, right? The first element of great pedagogy is the teacher. The Pen Pal Exchange system depends upon a skilled teacher’s ability to plan a successful writing project, with goals, lessons, and evaluations. (We have preloaded an example of pen pal writing tasks that you can use or modify.) To support this half of the equation, we have developed a pen pal template development page that guides the teacher step-by-step in specifying the topics the students write about, in itemizing the required vocabulary, in establishing the minimum number of words for each message, and in tolerating no more than the maximum number of errors you are willing to allow. The second part of the equation is the technology. The best-laid plans of mice and men often go awry if the available resources are missing. Planning to have 150 students write 10 well-developed meaningful messages to pen pals in 10 weeks and receive handwritten feedback on errors and vocabulary is likely to exhaust even the most energetic teacher. That’s why I have incorporated the Virtual Writing Tutor’s grammar checker, word counter, and target structure checker into both the editor students use to compose their messages, and behind the scenes to check their messages automatically for the requirements of the assignment and record scores for the teacher to review. Combining your plan for a series of form-focused writing tasks with the Virtual Writing Tutor’s onboard corrective feedback tools ensures good English language pedagogy: maximizing the repeated exchange of meaningful messages with a form-focus. Add in Mastery Model scoring so that the student’s grade matches his or her effort and ambition, and students keep working and working at their English writing until they get the result they want. There is another way that technology can support the success of a pen pal exchange project. Tracking who wrote to whom is a major headache for teachers in trying to develop a pen pal writing project involving students in different classrooms. It seems simple enough: have students write messages, collect them up, and redistribute them to students in a different group the next day. However, the mounds of paper to collect and distribute can get messy when playing postman. 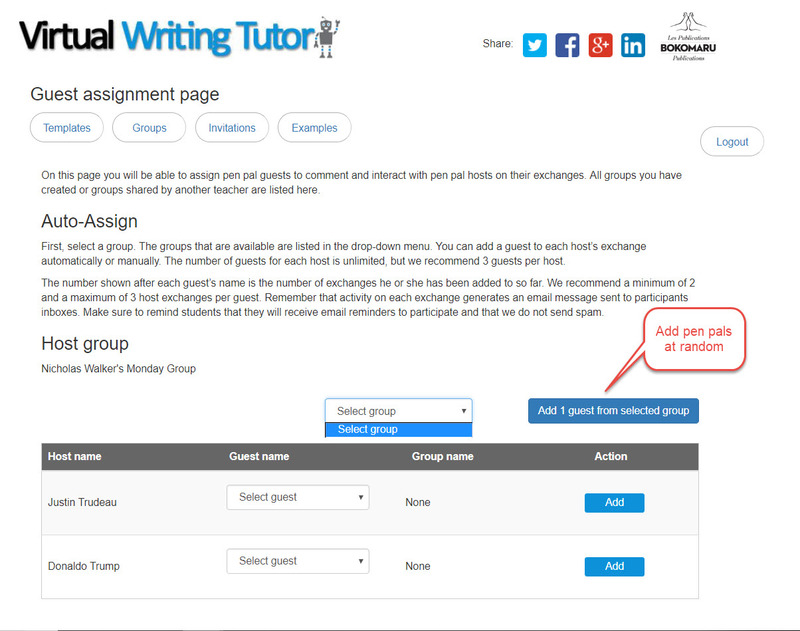 So, the Virtual Writing Tutor’s ability to track and direct messages to multitudes of pen pals with email reminders helps to ensure a successful pen pal exchange for English Second Language learners. Your Virtual Writing Tutor Pen Pal Exchange is sure to help your students develop their basic interpersonal communication skills very quickly. Ready? Start your Pen Pal Exchange project here. FYI: it’s free, I don’t send spam, and you can delete all traces of your project when you are done. What can a teacher do? Minimum word count — the minimum number of words and a score for meeting or exceeding the minimum word count. Max # of errors — the maximum number of grammar and spelling errors to allow in a message to receive the full score. Required target structures — a list of target structures to use in a message, the minimum number of those target structures to include in a message, and the score for meeting or exceeding the minimum number of targets in a message. A photo — depending on the topic, the teacher may wish to require a photo. 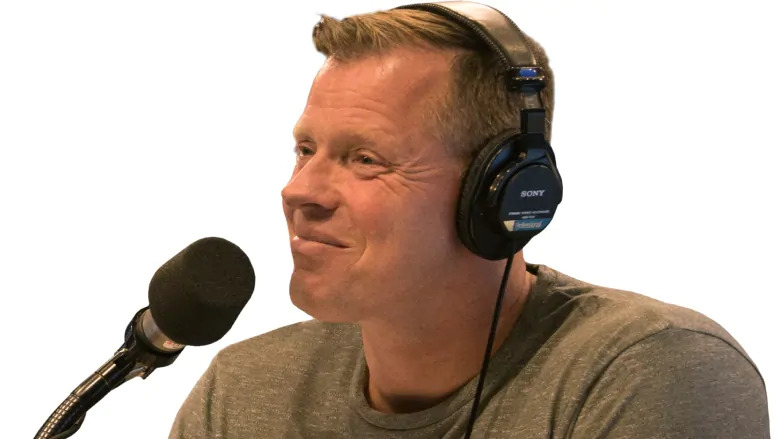 A voice recording — students benefit from a 10% improvement in explicit recall of vocabulary items when they are read aloud (compared with silent study), so a teacher may want to require a voice recording of each message to enhance recall. What are students able to do? The Virtual Writing Tutor can detect thousands of error patterns and provide explicit feedback on spelling and grammar errors. 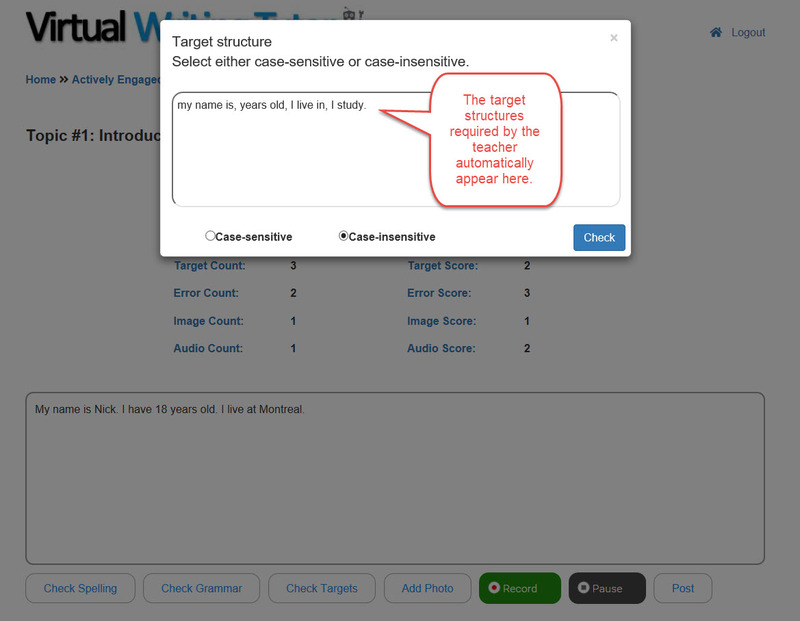 It can also count words and detect the use of target structures in a message. 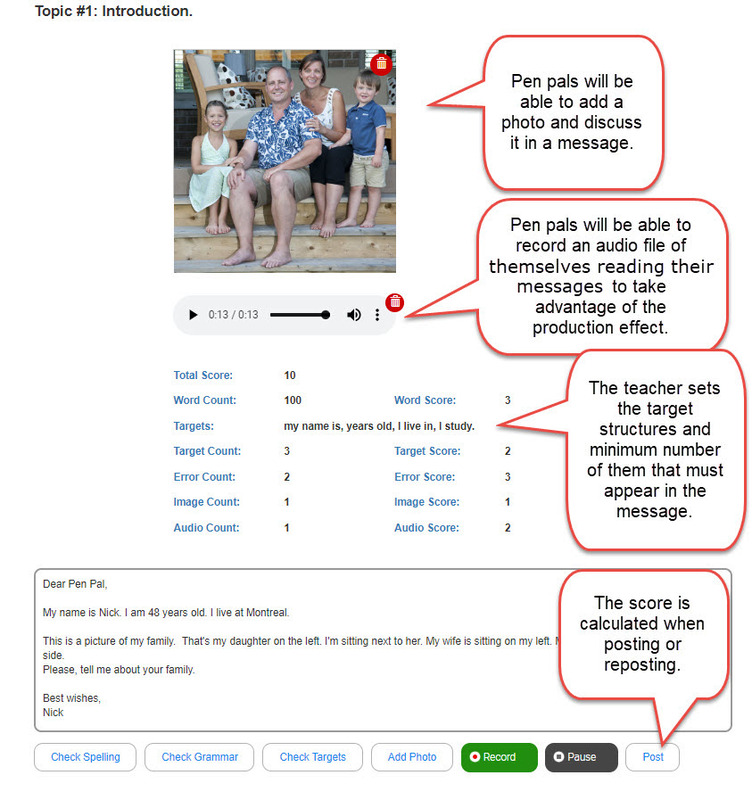 Based on what the VWT finds, the system automatically generates a score determined by the number errors, number of words, number of targets structures, and the inclusion of a photo and an audio recording in the pen pal’s message. 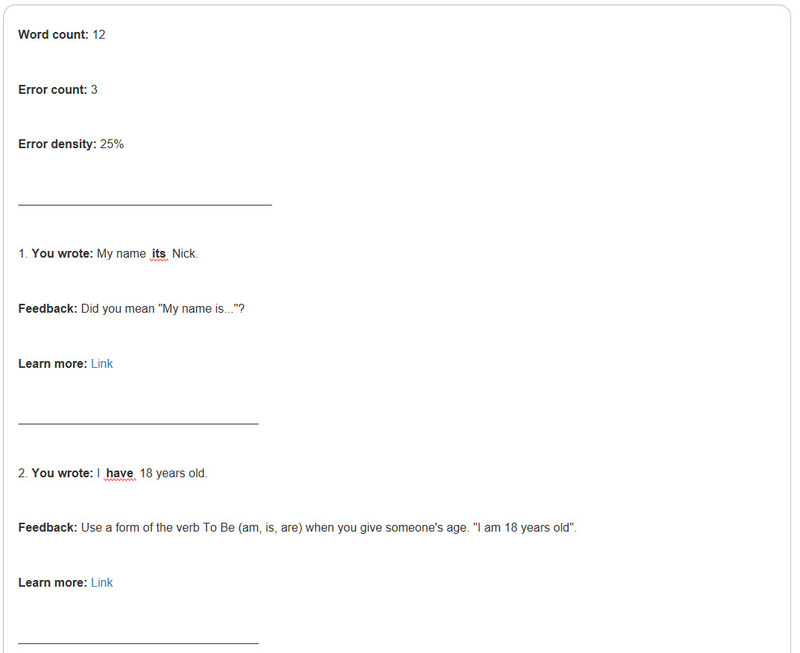 It also calculates a score based on the number of replies a student makes on other students’ messages. 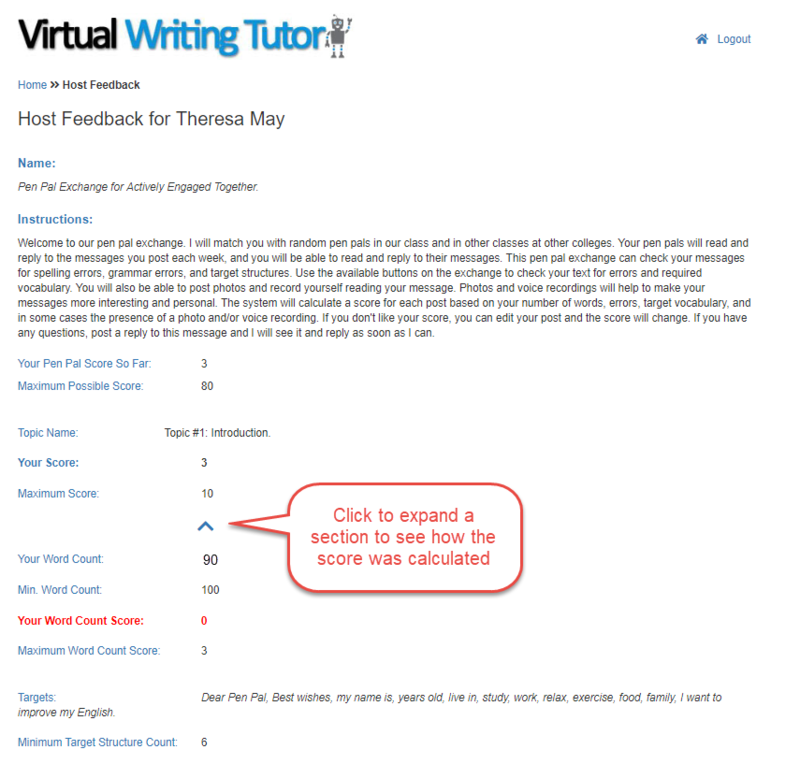 In other words, the Virtual Writing Tutor gives automatic feedback on the repeated exchange of meaningful messages with a form-focus. The system allows pen pals to write on any topic. This semester, I intend to get my students to write on a series of standard topics. To see the writing project I have planned for them, download my list of topics below. What does the Pen Pal Exchange look like? The topic list looks like this. You can have as many topics as you like. The first topic in blue is standard. It is a message form the teacher who moderates the exchange. The topics in red that follow are set by the teacher using a template creation tool. The teacher can add as many topic as he or she wants. The editor used to write a message to your pen pals looks like this. The feedback on spelling looks like this. The feedback on grammar errors looks like this. You get feedback on target structures like this. 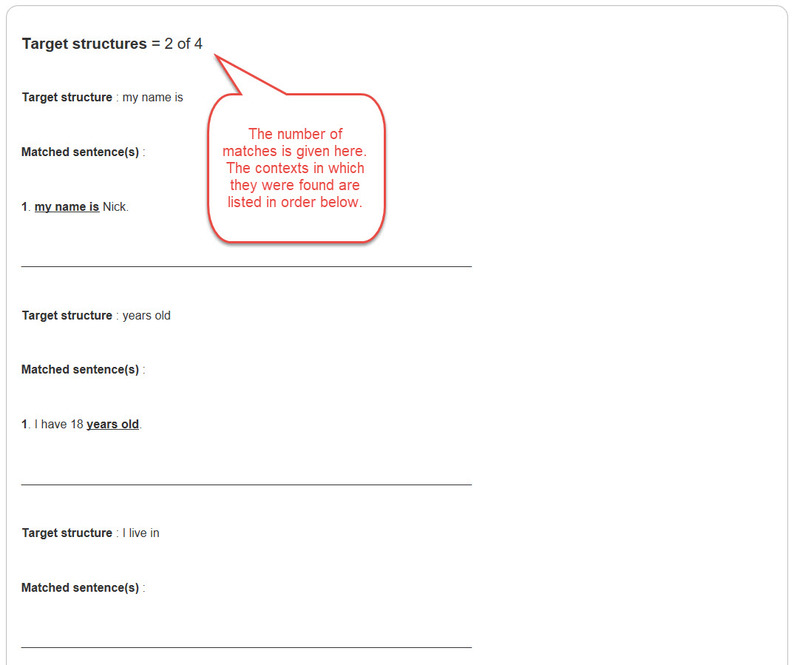 The list of target structures set by the teacher in the exchange template is automatically added to the search tool like this. The feedback on the the use of target structures looks like this. Students have a dashboard that gives them access to a range of information, which they can access with hyperlinks. For example, they can hop over to their own messages, the messages posted by their pen pals, and see the people in their group. Clicking on a score take the student to a detailed view of their feedback. Teachers also have access to this view. What do the teacher’s tools look like? You can match students like this. You can add pen pal guests to an exchange manually or automatically. 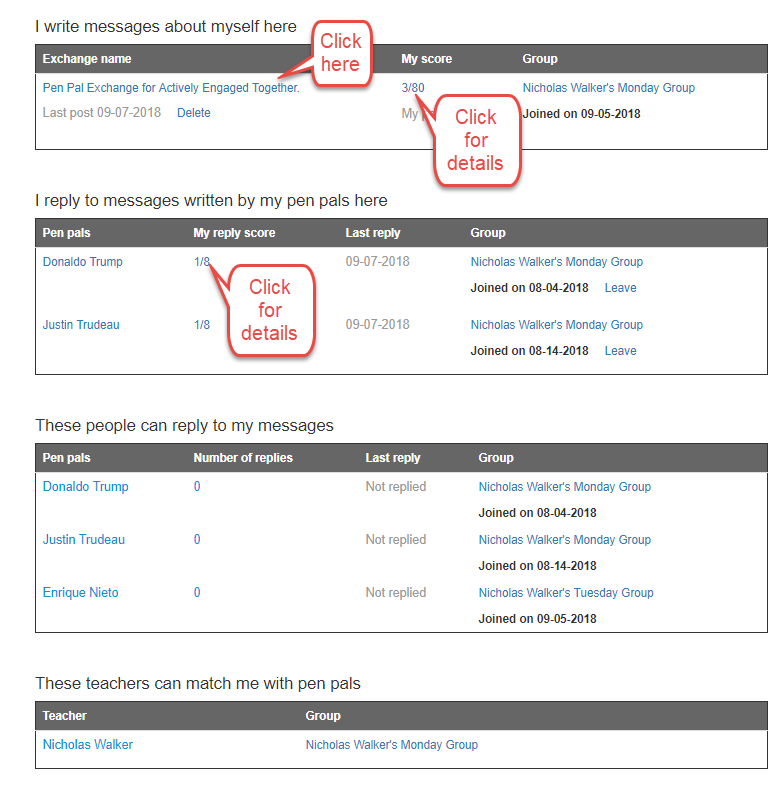 Teachers can see group members, deploy a template, and match students with pen pals from the same or different groups. The teacher can get an overview of the students’ score or see in more detail the individual scores that contribute to the student’s total score. 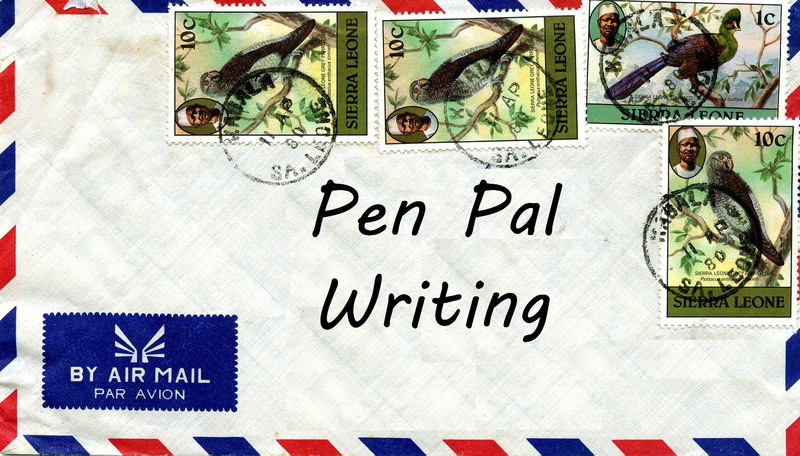 Click on the image below to read the article about pen pal writing. 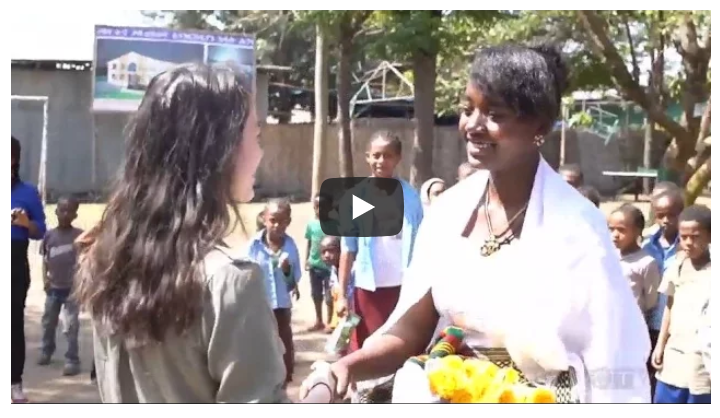 It could serve as good introduction to students in preparation for a pen pal exchange.